This article was originally published in Spectrum Autism Research News. The name rang a bell with Liz. She had a vague recollection of seeing a 1979 made-for-TV movie called “Son-Rise: A Miracle of Love.” In the movie, a New York advertising executive named Barry Neil Kaufman and his wife ‘cure’ their son’s autism at home, spending more than eight hours a day immersed in his world and copying his behaviors. The therapy seemed worth a shot. So in August 2005, Liz and her husband paid $1,623 in fees, left Sam, then almost 4, with a family friend, and drove to the institute’s 100-acre campus for a five-day Son-Rise ‘startup’ class. The angular brown buildings scattered in the woods give the institute the look of a New Age monastery. Adding to the monastic vibe, participants are advised to leave their valuables at home because the dormitory doors lock only from the inside. Liz hadn’t anticipated how deeply the experience would affect her. Having a child with autism can feel isolating, and because Sam didn’t participate in school activities or have friends, she had few friends herself. But on the first day of the Son-Rise Program, as she took a seat on the floor of the lecture hall with about 100 other parents, she immediately felt at ease. “You have a powerful sense that you are with cousins,” she says. On Tuesday evening, Barry Neil Kaufman, known as “Bears,” made his rounds in the dining hall, clad in his usual getup: a blazer and a black turtleneck. Liz found his message of love and acceptance intoxicating and, for the first time since Sam’s diagnosis, felt she had a way to help her son. When Kaufman spoke of children with autism as having limitless potential, his words resonated strongly with Liz. Over the next four years, she spent nearly $50,000 on Option Institute programs, both for Sam, her husband and herself, and to train as a mentor for other parents. Although that amount may seem extreme, she is hardly alone: More than 30,000 families from more than 120 countries have participated in the Son-Rise Program over the past three decades, according to the institute. Some families pay full price to attend multiple courses, others receive scholarships from the institute, and a few even resort to crowdfunding. “Your generosity would allow our beloved son to experience the best treatment available,” reads one plea to raise $25,000 on the GoFundMe website. At the same time, autism researchers express frustration that the Kaufmans discourage parents from combining Son-Rise with proven behavioral therapies and direct them instead toward alternative treatments, such as horse therapy and homeopathy. Some former employees Spectrum interviewed describe the institute as rule-bound, lacking in transparency and focused on fundraising. The Kaufmans, they say, control nearly every detail of the program and demand unstinting loyalty from staff and commitment from families. Bryn Hogan, executive director of the institute’s Autism Treatment Center of America and the Kaufmans’ daughter, says that the center welcomes more research on its programs and that the criticism it’s received is unfair or inaccurate. “People tend to be suspicious of things they don’t fully understand,” she says. When the Son-Rise Program launched, it was, in some ways, considered revolutionary. In the 1970s, scientists understood little about the biological basis of autism, and the options to help children with the condition were few and far between. “We didn’t know anything about what to do with them,” says Bryna Siegel, a developmental psychologist and founder of the Autism Center of Northern California, a nonprofit organization that provides diagnosis, treatment planning and support. In his now-discredited 1967 book, “The Empty Fortress,” psychoanalyst Bruno Bettelheim blamed cold, unresponsive “refrigerator mothers” for autism and recommended institutionalizing their children. At the same time, psychologist Ole Ivar Løvaas had started to advocate the use of rewards and punishments to help children on the spectrum communicate more and harm themselves less. His approach, which now falls under the umbrella of applied behavioral analysis (ABA), is the most widely used therapy for autism, but it is not without controversy. Some adults on the spectrum who have experienced ABA decry the idea of forcing children with autism to conform to neurotypical standards of behavior. Son-Rise, by contrast, is intended to tap into the well of unconditional love that parents feel for their child. Although the Option Institute declined to make Kaufman available for interviews, he responded by email to questions regarding this article. He also described the method and its origins in detail in his 1976 memoir and in subsequent publications and videos. With dark, expressive eyebrows and a snow-white beard, Kaufman looks less like a young James Farentino, who plays him in the movie, and more like an aging folk singer. The Son-Rise story, as Kaufman relays it, begins with his third child, Raun. As an infant, Raun had a severe ear infection that nearly killed him, and he subsequently retreated inside himself. By the time he was about a year old, the curly-haired boy spent hours each day rocking back and forth or spinning plates on their edges. When he was 18 months old, doctors diagnosed him with autism and an intelligence quotient (IQ) under 30. In the Son-Rise movie, which is based on Kaufman’s memoir, one physician tells Kaufman and his wife she can do nothing for Raun until the boy is 3 years old and, even then, it will make little difference. “Wait a minute, wait a minute, Dr. Field. 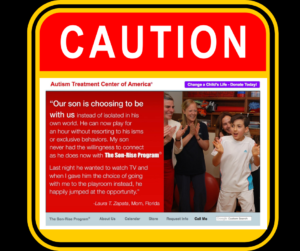 Are you saying autism is not curable … it’s not treatable?” Kaufman asks. “I’m saying that we can’t offer him much hope,” the physician replies. When Raun was 10, the family bought 86 acres of land in Massachusetts for $400,000 and founded the nonprofit Option Institute to share their methods with other parents and would-be practitioners. Today, the Autism Treatment Center of America’s website describes Raun, its global director of education, as having a “near-genius” IQ. “I’ve lived the life I was never supposed to live,” the 43-year-old Brown University graduate wrote in his 2014 book. 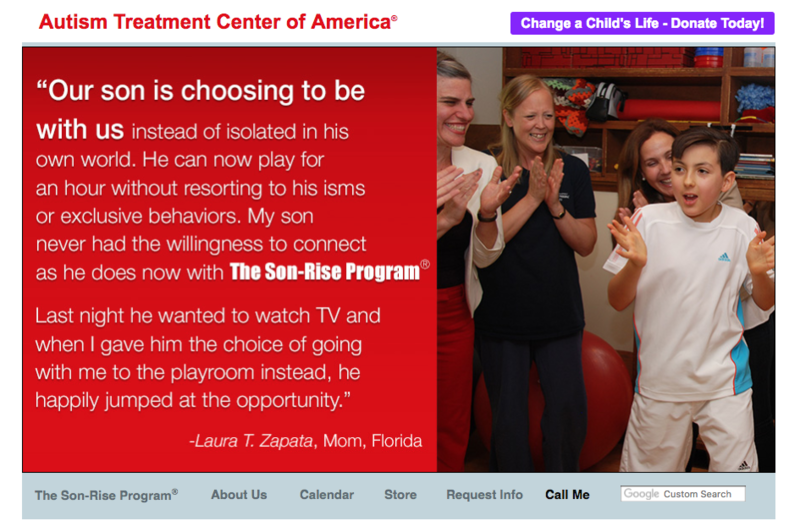 The institute often features Raun in its advertising and plays up the contrasts between Son-Rise and ABA, criticizing the more widely accepted approach for having lax training standards for facilitators and creating “robotic” children. In 2010, for instance, Raun produced a series of videos that were a play on the “Get a Mac” ad campaign from the early 2000s. In his version, a slouching nerd in a tie represents ABA, whereas Raun, sporting a hip goatee and a black leather jacket, embodies Son-Rise. “Would you rather your child be able to perform 25 scripted behaviors or would you rather he be able to relate to people?” he asks. Hogan says that her adopted daughter, Jade, now 22, has also “recovered” from autism thanks to Son-Rise. (Jade was never diagnosed outside the institute.) For decades, recovery stories like this confounded researchers, who characterized autism as a lifelong condition. When they came across a child who seemed to lose his diagnosis, they often assumed he had initially been misdiagnosed. In her 1996 book, Siegel has expressed skepticism about Raun’s autism diagnosis alongside her doubts about the program. Since that time, however, opinions about the permanence of an autism diagnosis have started to shift. A 2008 review of autism outcomes reported that between 3 and 25 percent of individuals with autism may eventually outgrow that label. Rather than calling these children ‘cured,’ researchers prefer to say the children have achieved an ‘optimal outcome.’ Some of these children become virtually indistinguishable from their neurotypical peers, says Deborah Fein, professor of psychology at the University of Connecticut, who has led much of the research. Magnetic resonance imaging (MRI) scans, however, reveal that the children recruit different brain areas during certain language comprehension tasks than typical children do. The finding suggests that instead of recovering, these children find ways to compensate for their neurological differences. The big question for both parents and doctors is whether behavioral therapy can increase the odds of achieving an optimal outcome. One 2014 study compared the histories of 34 children and adolescents at the mild end of the spectrum with 25 individuals who had achieved ‘optimal outcome.’ It found that the latter were more likely to have had a diagnosis by the age of 4 and, consequently, ended up receiving more attention from therapists, notably ABA practitioners. “The window is most open the younger they are,” Fein says. Other studies suggest that the type of intervention is less important than the families’ participation. Michael, now in his 20s, is tall and sturdily built and has an unguarded, earnest manner. After he graduated from college, he interviewed for a job with the Option Institute but says he wasn’t “animated” enough — something he says the institute’s staff prize in the employees they train to work with children. Even so, Son-Rise is still a big part of his identity. When he isn’t at work as an insurance broker, he volunteers to help a local family the institute put him in touch with. Because the program recommends at least 20 and ideally more than 40 hours of treatment a week, families often recruit a half-dozen or more ‘play’ volunteers, from high school students to adults like Michael who are interested in autism. One morning in March, I joined Michael as he drove out to meet the family in Pleasanton, California. On this Sunday, as soon as Michael gets out of his truck, a gangly 13-year-old named Jay runs up and puts his arm around Michael, hustling him upstairs to the family’s playroom. As the Son-Rise program recommends, the room has a one-way mirror on the door, and is empty except for a few cushions for seating, along with props brought in based on the child’s interests. Jay is fascinated by birthdays, for example, and on the walls of his playroom hang sheets of paper listing the birthdays of Jay’s volunteers, friends and family members. “Squeeze my feet,” Jay says.